Many items are not quite ready yet. Please email to be placed on our waiting list. Thanks. 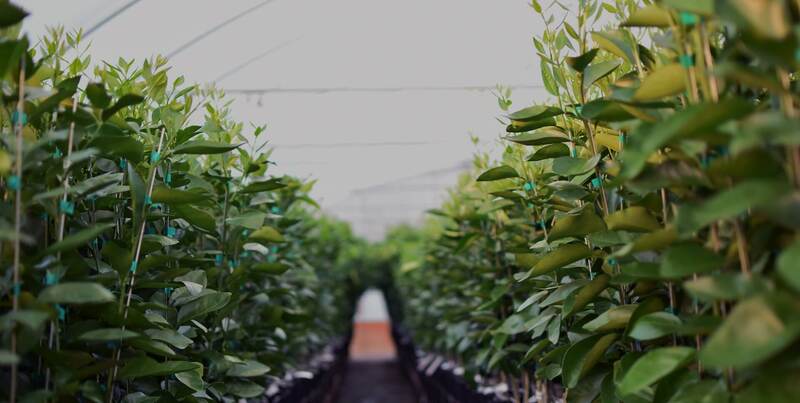 We are a family owned and operated containerized citrus nursery. We have been selling to commercial growers since 1998, and were involved in the citrus industry for many years prior to starting our nursery. Our commitment to quality shows throughout our business and we know you will be able to see it in our trees. We recognized that many homeowners like to have fresh fruit in their own yards, so we also sell to homeowners and garden centers. 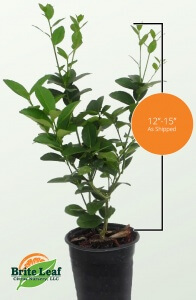 We pride ourselves on supplying high quality citrus trees. This is how we make our living, so our commitment to quality trees and service to our customers is extremely high. 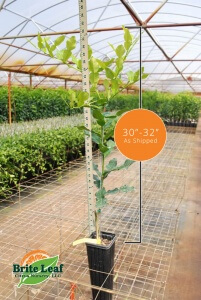 Why are Brite Leaf Citrus Nursery Trees better? Our trees are 30 – 32″ tall and about one year old. We grow our trees in the same pot that we grow commercial trees. It is a 4 inch square pot that is 14″ tall. The pot is equivalent to a “1 gallon” capacity. Getting the soil with the tree greatly increases your success with your new citrus tree. We grow a standard size, budded tree. We also offer dwarf rootstocks for some varieties. We now offer a rooted cutting/bush type plant for some varieties. How tall is the tree I am purchasing? Standard and Dwarf grafted trees are approximately 30 – 32″ from the soil line to the top of the tree. Rooted Cutting/Bushes are 12 – 15″ from the soil line to the top of the plant. How old is the tree I am purchasing? Our grafted trees are approximately 1 year old. Our rooted cuttings are approximately 6 months old. How much space do I need to plant a citrus tree? We recommend planting standard trees 15 feet apart. You can plant closer, but pruning will be needed at some point. Dwarf trees can be planted 8 feet apart if planted in the ground. If you choose a container, then we recommend a pot that is at least 14″ deep and around 16″ in diameter. A 10 gallon equivalent works great. How big will the trees get? Dwarf – up to 8 feet tall in the ground, less if kept in a pot. All others – 12 – 15 feet tall in the ground, less if kept in a pot (more pruning will be required to keep in pot). How long before I will have citrus fruit? Fruit production depends on age of tree and care. Typically, our trees will bear a few pieces of fruit within two years after you receive it. The amount of fruit will increase each year. Some citrus varieties are more prolific (kumquats, limes, calamondins), so you will have more fruit in the first year. Don’t forget to “feed” your trees so they will feed you! To see when you can expect to harvest your citrus fruit, see the harvest chart on the education page. Citrus trees respond well to pruning. You can do it almost anytime. It is best to prune when the tree is not blooming to avoid cutting off future fruit production. Why can't you ship trees to CA, TX, AZ, LA? Due to the widespread occurrence of Citrus Canker and Citrus Greening (Huanglongbing), the USDA placed the entire state of Florida under quarantine. It is against the law to ship or move trees outside the state unless you receive USDA certification and comply with the USDA compliance agreement. It is still against regulations to ship trees or citrus plant material to California, Texas, Arizona and Louisiana. This regulation exists to protect the citrus industry in those states. Likewise, it is illegal to bring citrus plant material into Florida from anywhere!